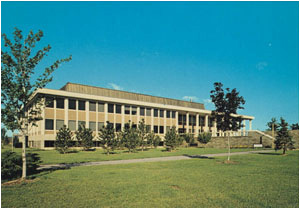 Eisenhower College was founded in 1965 at Seneca Falls, New York, by a group of central New Yorkers who interested President Eisenhower in a small, private, Presbyterian liberal arts college as a living memorial. Never religiously oriented, the college attracted an outstanding faculty and became well known and highly respected for its unique general education program of World Studies. The faculty and the curriculum had a profound affect on students, as national tests showed. Unfortunately, the college was underfunded from the beginning. President Eisenhower was still alive when Congress designated the college “a permanent and living memorial to his life and deeds” and appropriated $5 million to get it started. This proved to be too little, and a $9 million congressional grant in 1974 proved to be too late. Rochester Institute of Technology tried to revive the college, but decided after three years that it could not. Eisenhower College closed its doors in 1983. Copyright © 2019 Eisenhower College Community. Powered by WordPress and Stargazer.